Phyllostachys Bissetii is a very cold hardy vigorous grower with dark gray-green canes for screening. Originally imported from Sichuan, China into the US in the 1941 by David Bisset, from whom it was named after. This species is well equipped to handle a vast range of growing conditions from climates in USDA zone 5 to 10. As with most bamboo species, Bissetii is less picky about soil and sunlight conditions than many plants. Even during severe winters this little bamboo, once established, will pop up beautiful new canes in the early spring long before other plants even turn green. Mature culms are erect and usually in the 25 to 30 feet height range, but depends on climate zone. Has a very dense dark green foliage making it an excellent choice for privacy and windbreaks. We have thousands of customers throughout northern climate zones growing this little beauty for an effective privacy screen. . In USDA Climate Zone 7+ expect mature size canes to 30'-40' feet in height. In USDA Climate Zone 6 expect mature size canes to be 18' feet in height. In USDA Climate Zone 5 expect mature size canes to be 12' feet in height. 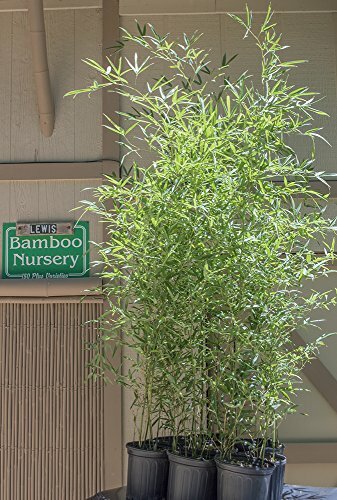 2 Gallon Bissetii Bamboo - Measures 2' - 3' feet tall. Multiple canes per plant. Most tolerant of adverse growing conditions, such as wind, cold, and drought. Withstands temperatures of -10° degrees. Provides an evergreen bamboo privacy screen and ornamental beauty. Obtains a darker green cane and foliage than most bamboo species. Average height can attain a height of 25-30 feet tall by 2 inch in diameter. If you have any questions about this product by Lewis Bamboo, contact us by completing and submitting the form below. If you are looking for a specif part number, please include it with your message.